Imagine slicing open an aloe leaf and consuming the gel directly from the plant. Our Forever Aloe Vera Gel® is as close to the real thing as you can get! Aloe vera has natural cleansing abilities that help the digestive tract absorb nutrients from the foods we eat into the blood stream, while promoting friendly bacteria growth. The unique polysaccharide, acemannan, and other nutrients in aloe help to support the immune system. In fact, acemannan is one of the key markers used by the IASC to indicate quality aloe vera and Forever Aloe Vera Gel® has nearly double the amount required for certification! Forever Aloe Vera Gel® is aseptically processed allowing the formula to remain free of added preservatives and boast an amazing 99.7% pure inner-leaf aloe vera gel. 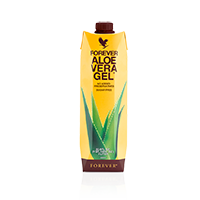 Packaged in Tetra Pak packaging made with 100% recyclable materials, Forever Aloe Vera Gel® ensures that you are able to enjoy the fresh taste of undiluted aloe vera gel with all of the potent properties of aloe just as nature intended.